When Judy and I were planning routes a evenings ago we came along this cycle-path. It's being upgraded from an older surface to modern smooth concrete, as has happened on many cycle-paths. However, while the new concrete is setting you can't ride on it, so half the road has been closed for bikes and drivers must wait at traffic lights not just once but twice within a few km. This might seem exceptional, but in the Netherlands it's not exceptional at all. This is actually quite normal (see all the examples on this blog together). If you want a high cycling modal share to be preserved while there are works, the subjective safety of cyclists must be preserved while the works take place. If this is not done then people may stop cycling themselves, and more importantly they may stop their children from cycling to school, and that is the route to less cycling in the future. The Fietselfstedentocht, an annual event which was held yesterday, is a 240 km long ride through 11 different cities in Friesland. This video is about Wiebe Idsinga, the last person to finish yesterdays' ride. The people in the broom wagon convinced him to take a ride with just 3 km left to go, and he was a little late finishing (you have to finish before midnight), but he still got a medal. Quite right too. I'm humbled. No English language subtitles and I won't try to explain what is being said (largely in Frisian). I don't think you need any of that. Suffice to say that at the end he wants to ride his bike home, but the organisers convince him to take a lift. The broadcaster, Omrop Fryslân, deservedly won a prize for their coverage of his ride in 2012 in video at the top. Thanks to Herbert Tiemens for making me notice the video. I've noted before that the workings of the Fietsberaad are quite often completely misunderstood by English language commentators. Sometimes this isn't so much the fault of those who read the publications as those who write them. A new example has come up, and this time it is especially ripe for misinterpretation ! "Almere has about 190,000 residents and the government has asked the municipality to expand by another 60,000 residences. A characteristic of Almere, as is the case with other new towns, is the strict separation of traffic types. Almere has, for instance, a completely segregated network of bus routes. The municipality’s new Mobility Plan will abandon this concept, at least in part, through the introduction of city streets. City streets are streets or lanes that exhibit a more urban look by diminishing the separation between the traffic and its surroundings. According to the municipality this should enhance the urban experience, participation, and public safety." That is all the English language version of the article says, and as a result it sounds like a straightforward case of a Dutch city giving up on segregation of modes. However, it's actually a case of a rather less than perfect translation which manages to give entirely the wrong impression of what is being done. The city is relatively spread out, and has many small centres. In its development is has provided fewer opportunities for employment than residences. This has resulted in many people having commutes which are too long for cycling. Also the cycle-path network in Almere has a problem with low social safety. These factors have worked against a high cycling modal share. Almere seeks to have a main cycle-path network of very good quality that links all important destinations, with 4 m wide red asphalt cycle-paths, direct routes with priority for cyclists (it was the first place in the Netherlands where I saw a traffic light which defaulted to green for bikes) and with a good record of traffic safety. Due to the low density of Almere, the city is finding the cost of maintaining a tight grid of high quality cycle-paths for the entire area is too high. As a result, maintenance doesn't meet the usual high Dutch standard. For this reason, while Almere will stick with a 300 m x 300 m grid of paths in urban areas, they are considering building cycle-paths at a lower density in less busy suburban areas. The lower density of cycle-paths in future suburban developments will be achieved by building them only when necessary. Streets in newer developments are less likely to have segregated cycle-paths than was the case previously, but if there are more than 15000 traffic movements per day, it would cause an unsafe situation, or would hinder traffic flow then segregation will still be used to improve safety and comfort. 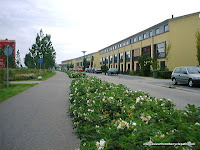 Furthermore, more attention is to be placed on the social safety of cycle-paths in Almere. Where possible, there should be more "eyes on the bike-path" so that people feel it is safer to cycle. There is to be more thought about where the paths go in order to make this so. The aim is to achieve at least one truly socially safe cycle-route between each district. So there you have it. An English version of an article which makes almost entirely a different case to the original Dutch, and which will almost certainly be misunderstood and misinterpreted by readers in the English language. I don't read every publication by the Fietsberaad in both Dutch and English, so I don't know how often this sort of thing happens. Almere is the newest city in the Netherlands, built on the world's largest artificial island, Flevoland. The first house built in Almere was completed in 1976 and the city is still under construction. For a Dutch city, Almere has a "low" cycling modal share. "Low" means that "only" 31% of all journeys under 7.5 km are made by bicycle, or 19% of journeys in total. These are very low figures for the Netherlands, actually lower than the average for the whole of the country (27% of journeys across the entire country are by bike). 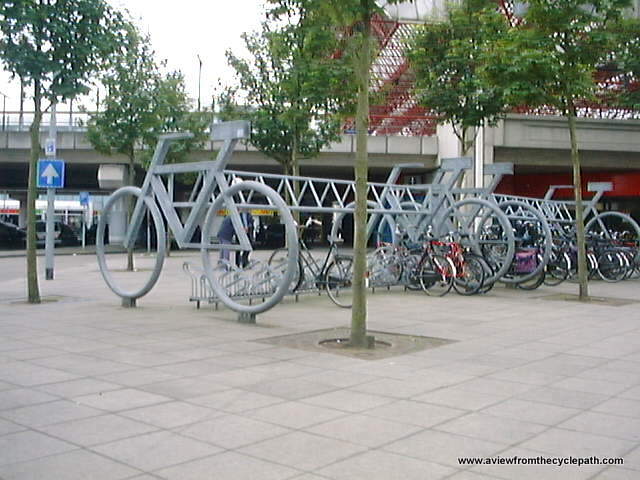 However, anywhere outside of the Netherlands, Almere would be seen as a leading cycling city. We are native English speakers with many years of experience of cycling both in the UK and in the Netherlands. We understand the contexts of both English speaking countries and the Netherlands. We do tours on which we demonstrate and explain how cycling infrastructure works in the Netherlands on which misunderstandings like these are avoided. Shared Space in Haren. When we visited on this Study Tour, a group of school children were doing surveys. I took part in their survey so was asked questions about how safe it felt. Meanwhile, other youngsters were counting how often cars gave way to bicycles in places where bicycles had priority over cars. Shared Space is deservedly unpopular, as it is seen as having brought back "might is right" to Dutch streets. A main route to Groningen. 3 m cycle path each side of the road. In the Netherlands, this is not called a "superhighway". Rather it is merely one of many very efficient cycle-paths which provide through routes between suburbs. Some of the many bridges in Assen. That in the foreground is on the most direct route and therefore is only for bicycles. That in the rear is for cars and bikes (on a separate cycle-path). Explaining why a 30 km/h street in Assen has a wide cycle-path next to it. This is not uncommon and arises where the cycle-route is more important than the driving route. A wide cycle-path next to a 50 km/h road near an industrial estate in Assen. This is not on a school route - this cycle-path is primarily for adult commuters. A 1950s suburb retrofitted to provide better conditions for cycling. Most children ride their own bikes. Only the youngest travel on their parents' bikes. The Berlagebrug in Groningen. This new bridge was part of the reason why Groningen didn't win "cycling city of the year" due to its steepness ("like Alpe d'Huez") and the perceived inadequate cycling provision on the bridge. The expectations of cyclists in the Netherlands are very high - expectations must be high in order that progress can be made. The next public study tour starts on September 11th 2012. Please contact us to book. For more information, please visit the study tour web page. Children ride their own bikes on a route which leads to the city centre. Riding side-by-side is essential with children. 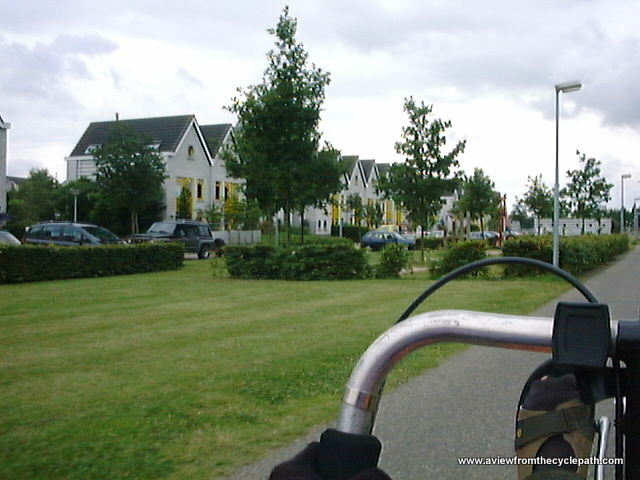 A route used by many secondary school students to ride home to villages South West of Assen. Teenagers always ride side-by-side because it's more sociable. Bicycle road along the canal. Easily enough space here for couples in both directions to ride side-by-side. Don't spill your drink while negotiating a safe roundabout in Assen. These photos illustrate the usual story. Cyclists in this country not only are safe, but they also feel safe. This is a place where everyone can and does cycle. This is possible because cycling in the Netherlands does not look nor feel like an extreme sport, unless you want it to. Being segregated from cars virtually 100% of the time makes this possible. Someone recently posted a comment on one of the posts on this blog in which he asserted that an average commute in Toronto was of the order of 25 km - 50 km each way. Like any extraordinary claim, this immediately raised a flag. Average commutes in other places are much shorter than this, and it seemed so unlikely that Toronto should have commutes which were so much longer than everywhere else on earth. I looked it up and found a very interesting website about commuting statistics in Canada. It turns out that Toronto does indeed have the longest commutes in Canada, but the average length is just 9.2 km. This is much shorter than suggested in the comment. The national average is 7.2 km, which is much the same figure as you'll find anywhere in the world. The same website also reveals that for the whole of Canada, 37.8% of commutes are over a distance of 5 km or less. Five km is a distance very easily covered by bike, but is that how Canadians make their short journeys ? It turns out that they do not. Ottawa is the leading large city in Canada for both walking and cycling, yet walking accounts for just 7.5% of commutes and cycling for just 2%. So if distances are not the problem, why do Canadians not use bicycles when their journey distances are short ? The reasons are the same in Canada as in every other country where few people cycle. The conditions that (potential) cyclists face are simply not conducive to cycling. There is little specifically designed infrastructure and cycling is considered to be like an extreme sport. Those who choose to cycle in Toronto and across Canada are "road warriors". i.e. they are members of that demographic who are most easy to convince to ride, largely young adults, predominantly male and without dependents. There is not the same wide range of demographic groups as you get with a successful and established cycling culture. As with many other cities around the world, some pockets of Toronto have a higher cycling modal share than others due to specific demographics, but the overall rate of cycling is low. Sadly, the mayor of the city has also recently been taking part in a well publicized "war on bikes" - another thing which makes the background such that cycling is unlikely to flourish. Distance is an easy reason to give for why the cycling modal share is low, but just as in other places where this excuse is made, a little investigation shows that distances are not the problem in Toronto. In fact, none of the popular reasons given for low cycling modal shares ever really add up. Rather, for cycling to become popular, a good degree of subjective safety is needed, and cycling must be associated with a high degree of convenience and safety. That is the biggest difference between the Netherlands and other countries. We have many examples of what works. It's the same story in other countries where claims are made that distances are "too long", including the USA. However, the reasons are the same too. Where there is inadequate subjective and social safety, few people cycle. Read previous posts about Canada for some of the reasons why. It's nearly two years since my last roundup of videos showing how road works don't inhibit cycling in the Netherlands, and here are two more videos showing different examples of the same thing. The principle remains the same: It is extremely important that cycle routes not only are kept open, but also retain a high degree of subjective safety, when there are road works. If this is not done then there is a good chance that people will be put off cycling, and if they are put off then they may never return to cycling. Cycling is inherently quite fragile. If it seems unsafe then people are less likely to take part. If routes to school don't seem safe then parents won't let their children cycle to school (something which almost all Dutch children do). If older people are expected to develop extra strength to deal with riding in unpleasant conditions, then they also would be scared away. This is why it is necessary to go to some lengths to keep cycling as an attractive and preferable alternative to driving or taking public transport even when works are necessary on cycle-paths or roads. Only if cycling retains attractiveness and convenience for all can everyone continue to cycle. It is necessary for cycling to have this wide appeal in order to have a modal share which is greater than anywhere else in the world. Countries with an ambition to grow their cycling modal share need to understand the importance of this. Cycling infrastructure needs to be seamless and simple to use for all ages and abilities, and cycling needs to be supported everywhere, not just where it is easy to do so. Only that way does cycling become a choice for the majority. Unless this is the case, cycling remains a minority pursuit. See also see the previous installment of Road Works vs. the Dutch Cyclist, which included four other videos like these. The second video in this post shows a small part of a 130 km journey home that we made together by bike last Sunday. As is usual when cycling in the Netherlands, this distance was covered mostly on cycle-paths but also on some stretches of roads with little traffic. Apart from cobbled surfaces through a few villages, leading in one case to another redirection. Not once on our journey did we experience off-putting conditions for cycling, and nor did we expect to find such conditions. Comprehensive infrastructure works not only for short journeys, but also for longer journeys. Challenges to growth in cycling in the Netherlands. Older people cycle more than ever before but their injury rate is rising. One graph can never show the multitude of factors behind the cycling modal share of a nation. 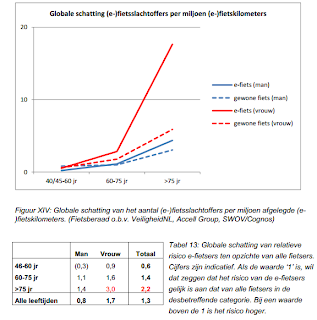 In this post, I'll point out how the usual chart which shows how cycling has grown in the Netherlands since the 1970s hides some major demographic factors which influence cycling, not all of them positive. Each year, the Netherlands loses about 30000 more people due to emigration than arrive as new immigrants. Many people who emigrate were born overseas and are returning to their land of birth, but also many Dutch people emigrate. This number, you'll notice, is smaller than that of births vs. deaths. Nevertheless, by 2010, this exchange of people between countries resulted in 11% of people living in the Netherlands having been born in other countries. Because all other countries have a lower cycling modal share than the Netherlands, this of course implies that immigrants were born in countries where it is normal to cycle less than in the Netherlands. Immigrants to the Netherlands try hard to integrate well with the local population and this includes their cycling habits. Immigrants living in the Netherlands cycle about as much as they would had they been born in and still lived in Finland or Germany. i.e. less on average than the native Dutch, but as much as people from other leading cycling nations. Clearly, though, we can't state that growth in cycling is due to immigration. Between the 1970s and now, the population of the Netherlands grew from 13 million to 16.5 million people. As we've seen, this is not due to immigration. It is also not due to a high birth rate. As is normal for developed nations, the Total Fertility Rate of the Netherlands (how many children are born on average to each woman) has been less than 2 for some time. In the Netherlands, the TFR has been less than two since 1973. Births still outnumber deaths in the Netherlands by almost 50000 people per year, and this is what has lead to population growth. Deaths are lagging behind births because of the increase in life expectancy and resulting increase in the average age of the population. Men can now expect to live 7 years longer than in the early 1970s and women 5 years longer. Women still live slightly longer on average than do men. Neither older people nor recent immigrants from countries with lower cycling rates are the easiest people to convince to cycle. Immigrants are encouraged to cycle. A successful initiative called Fiets Vriendinnen ("Cycling Girlfriends") is the only organisation that I'm aware of which cycle training for adults. Specifically, they offer cycle training and support for women new to the Netherlands, performing a useful function of helping people to integrate into Dutch society. However, something else has happened which many people may find surprising. 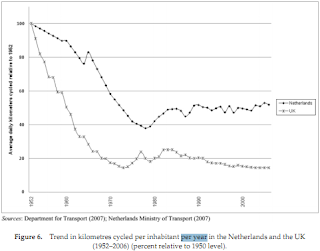 Elderly people in the Netherlands now cycle nearly three times as much as they did in the 1980s. It is the rise in the number of retired people cycling which has driven the growth in electric bicycle sales in the Netherlands. A group of older people who passed us a couple of Sunday afternoons ago. It is not at all unusual to see groups of retired people cycling for pleasure in the countryside. Other growth has come from specific areas. For instance, cycling to railway stations, where literally hundreds of thousands of extra cycle parking spaces have been built in an attempt to keep up with growth in usage in the last few years (40% of train passengers now arrive at railway stations by bicycle). Many Dutch towns have seen increases in cycling alongside improvements to infrastructure. This is true of the capital, Amsterdam, of the top cycling city in the Netherlands, Groningen, and also of the small town of Assen, where we live. What about that rise in transport related deaths ? Obviously any rise in deaths is something that has to be taken seriously. First some context. Overall, roads and cycle-paths in the Netherlands are amongst the safest in the world. They are much safer than they were in the early 1970s. The improvement in safety have come in large part from following the principles of sustainable safety. Different modes are separated, keeping cyclists away from the danger from motorized vehicles even when you might not think this was happening. downward trend over time. It is not an imaginary trend. 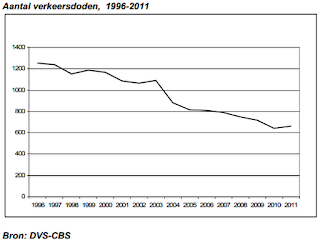 Sadly, for the first time in several years, 2011 saw the number of deaths on Dutch roads increase. This has seen alarming commentary from some quarters about how the roads are becoming more dangerous, but I do not believe this to be the case. Rather, this is a bump on a graph which still depicts a downward trend. The rise was small, 3.3%, and 2011 was still safer than 2009. Perhaps the same sorts of comments concerning a "rise" were made when this last happened, in 2003. In 2011, there were 661 deaths compared with 640 in 2010 (these figures are for all road users, not just cyclists). December 2011 was a particularly deadly month with 81 people losing their lives in that month alone. Without this unusual one month peak, the figures could have been lower than for 2010. There is always "noise" in figures of this nature. It's important not to take too much notice of year on year changes as they can be so misleading. While one cannot make any prediction based on the graph, it looks more like the continuation of a steady downward trend than the beginning of an increasing trend, and we should note that the December figures which particularly made a difference last year are likely to be due to particularly unhelpful weather. Of the 661 deaths last year, 40% or 269 were of people over the age of 65. Nearly 1 in five, 126 people, were aged over 80. This is a reflection of how active older people remain the Netherlands and also of how vulnerable older people can be in crashes which might cause less serious injuries in younger people. We see the same if we look just at cycling casualties. Over 65s cycle around 12% of the total kilometres cycled each year in the Netherlands. However, almost 2/3rds of the cyclists who died in the Netherlands last year were of people aged over 65. 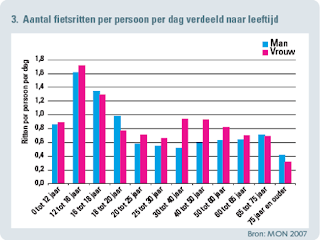 In total, 200 cyclists died in the Netherlands last year, a rise of 38 over the year before. This is quite a sharp rise in one year. It compares with 185 in 2009, which makes for a less dramatic change. It is still part of a downward trend, and the Netherlands remains the safest country in the world for cyclists. Why are older people falling victim more often ? It is an unfortunate fact that as you get older, you also become more delicate. Injuries which might cause nothing more than a little discomfort when you are young can cause a broken bone when you are older. Those which might have resulted in a broken bone can result in death. The rise in electric bicycles has been blamed for older people suffering more injuries and deaths. One study claims that while electric bikes are not much different in safety to non assisted bikes for younger people, there is a relationship between an assisted bike and a higher rate of injury amongst older people. Such bicycles are sold almost exclusively to retired people, and for this age-group they result in being able to ride faster and further than before, without improving the rider's reaction time or strength. at risk of injury. Two possible explanations are offered. 1. More fragile people tend to buy electric bikes. In either case, extra investigation is needed. However, it would appear that the main reason why older people are falling victim more often is that they are cycling more often. Between 2000 and 2010, the number of kilometres ridden each year by over 65s more than doubled. Over 65s now cycle nearly three times so much as they did in the 1980s. In the Netherlands, cycling suffers from the "Golf effect". Just as regular gentle exercise by cycling extends life-expectancy, golf has been shown to do the same. However, a surprisingly high number of people die of heart attacks when playing golf. It's not the game that kills them, as golf has few risks, however the combination of an aged demographic and that playing golf can take quite a long time means that there is a fair risk that regular players will die when they are playing golf. Many older Dutch people spend a considerable amount of time cycling, and the same will be observed. In 2005, a study showed that the number of visits to hospital by older cyclists had risen by 55% between 2005 and 2009. The total distance cycled by this group had also risen by 50% over the same period. In 2010, a study showed that elderly cyclists ran 3.2 times the risk of injury than younger cyclists, and that this was due not to having more crashes, but due to the relative fragility of older people. It also showed that 10% of total cycled kilometres in the Netherlands are ridden by the over 65s, and a link was shown (again) between improvements to cycling infrastructure, an increased rate of cycling, and lower risks for all cyclists. 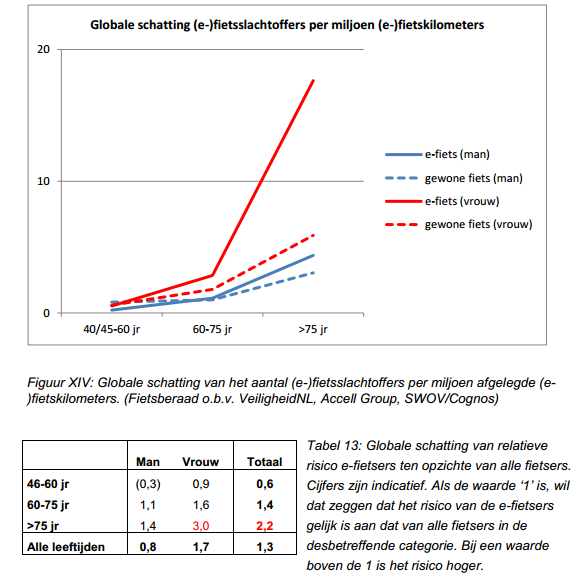 It is expected that the ageing population will eventually reduce the cycling modal share because older people in the Netherlands cycle less than younger people. In 2007, a study suggested that ageing of the population could be expected to slowly reduce the rate of cycling in the Netherlands. It also predicted a rise in serious bicycle crashes of 10% over 20 years for much the reasons that we have seen start to occur. This study also showed that immigration was thought unlikely to have a very large effect because the number of immigrants remains small. That same study includes an interesting table which shows the percentage of cycle trips by over 65s in 2005 for each local government area, compared to what it is expected to be by 2025. In Assen, for example, 12% of cycle journeys were made by over 65s in 2005, and this is expected to grow to 16% of cycle journeys being made by over 65s in 2025. This is about average for the whole country. Of course, the Netherlands isn't standing still. A new organisation, the National Investigation into Cycling Safety has begun to work on improving future safety for cyclists in the Netherlands. It is important that standards for cycling infrastructure continue to improve. Only with improvements in standards can the cycling modal share be preserved despite the challenges of demographic change. All three types of safety are important. Last week, British politicians compared Dutch and British cycle safety figures in rather a confusing and perhaps even deceitful manner by referring only to the absolute number of deaths in both countries. It is of course true that the Netherlands has a higher rate of cycling injury per hundred thousand people. However, this is because while everyone cycles in the Netherlands, and as we see above, this covers a very wide range of demographic groups, only a minority cycle in the UK and they're largely young adult males. Comparing per km cycled, even though the Dutch cyclists include far higher levels of more vulnerable groups (not only older people, but also children and people with disabilities), the figures are very much better for the Netherlands than the UK, even taking into account the increase last year. Several people blogged about this, but I refer you to "(Drawing) rings around the world" for accurate figures. Someone quipped that by the same logic as used by the British Transport Ministers, Switzerland could perhaps learn a lot from the UK's good record on skiing safety, and it's a valid comparison. Any British politician who wants to know what the difference really is between cycling in the Netherlands and cycling in the UK only has to ask us to find out. We do tours specifically for this reason, but not one British politician has yet come to see for themselves. 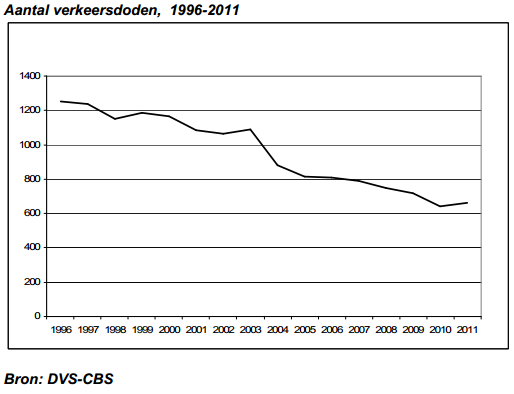 Traffic safety figures in the Netherlands have continued to improve despite the upward tick in 2011. The total number of deaths in 2012 was 650, roughly the same as 2011 but this improved in 2013 to 570. That's the lowest figure ever. 184 cyclists lost their lives in 2013, only five of whom were under 15 years old. 124 of the cyclist deaths were of people aged over 60. Over 2/3rds of the total and continuing the trend of their being the most vulnerable people being injured in single-sided crashes. Investigations into the cause of the rise in injuries and deaths continue. If the person who made the quip about skiing safety reads this, let me know and I'll link to you.